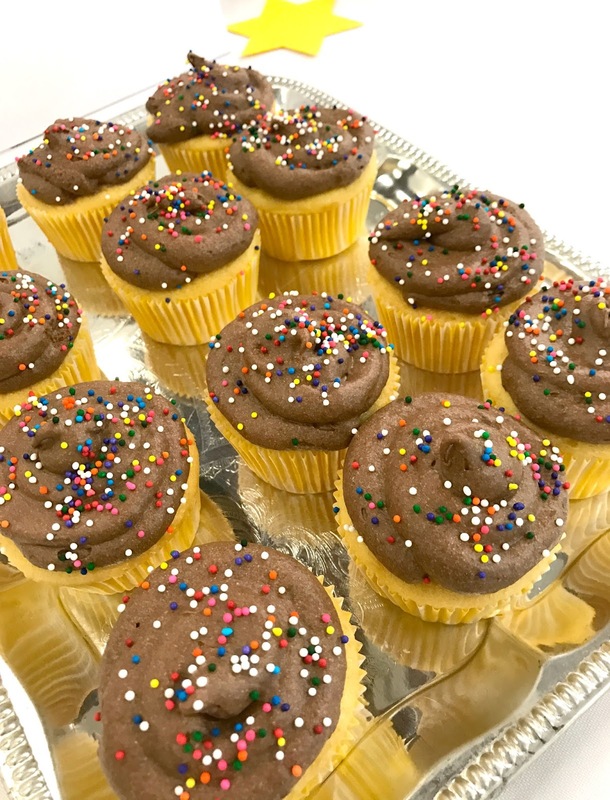 It's time to raise money! 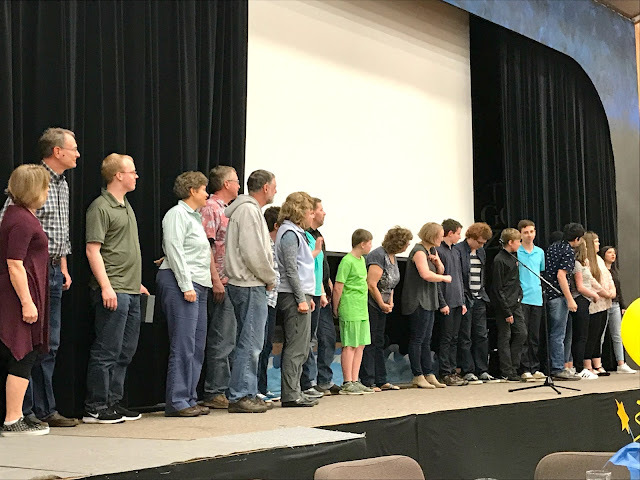 An adult and youth team from our church is heading to Alaska Christian College to help finish the building of a new dormitory. 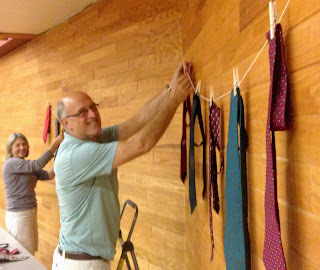 The group will be dry-walling, painting, moving furniture, etc. etc. They need funds to get there and to give to the school's projects. 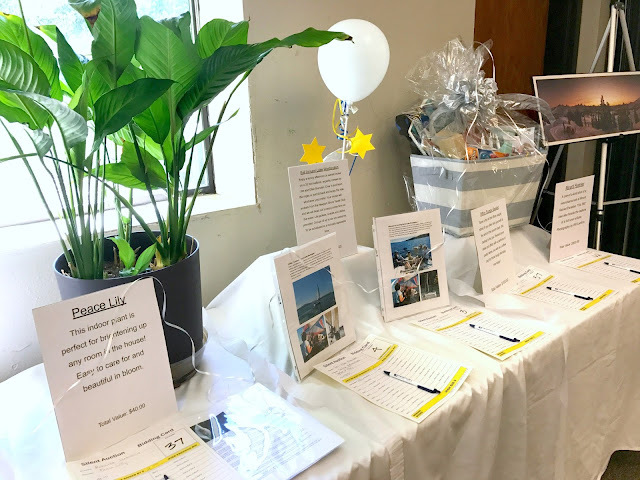 Take a look how we were able to raise over $12,000 at our church's silent auction! The date was set, tickets were sold and Alaskan salmon was donated and shipped in for dinner. 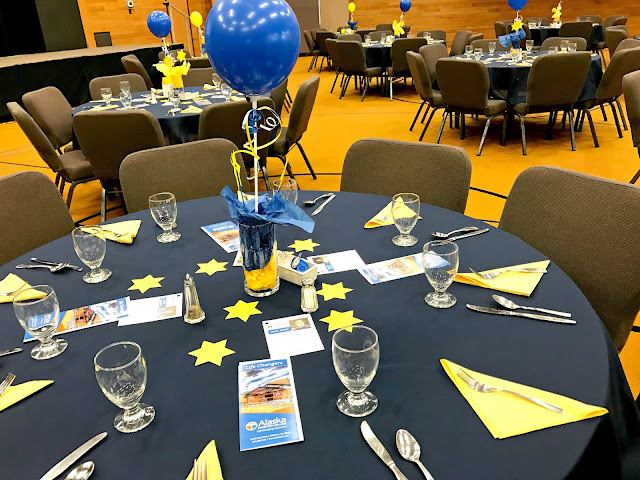 Volunteers cooked the meal, silent auction donations were procured by the team and I was in charge of the set up. 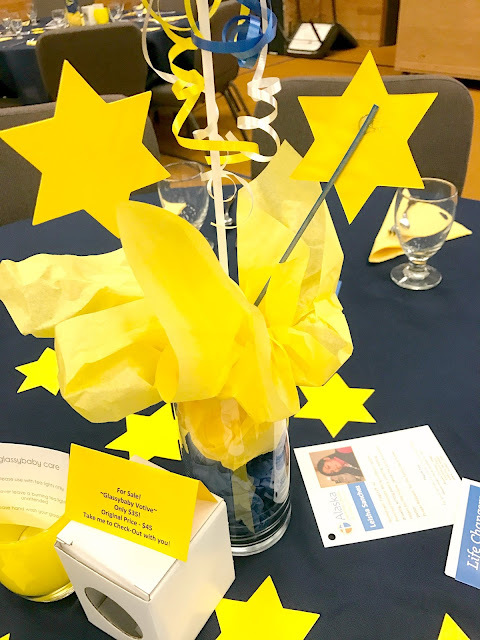 Let's start with the table decorations...my favorite. Budget? Spend as little as possible and make it look festive. Yes, I've done a few of these types of events before. 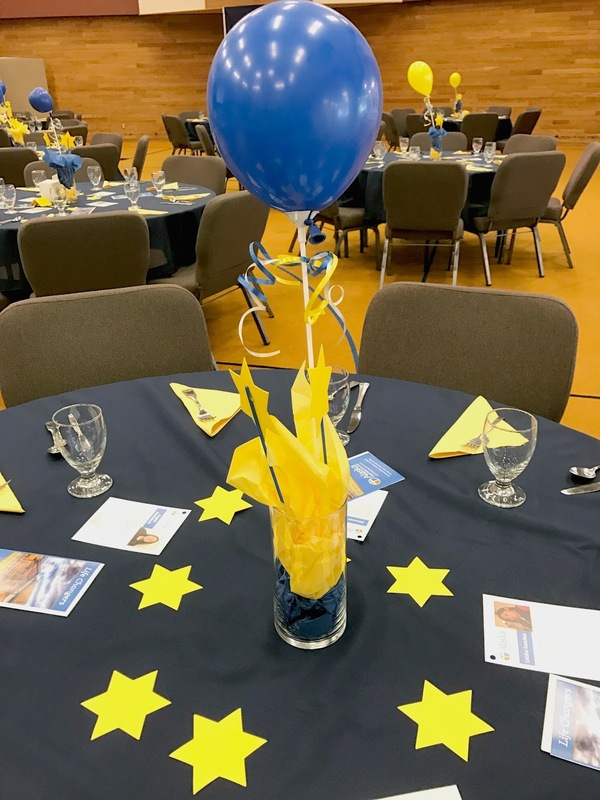 First choose a color theme-- we went with blue and yellow (the school's colors) and yellow stars because they're on the Alaskan flag. To get the most bang for your buck, always use balloons! They fill a space up and set the tone for a party. (This post contains affiliate links to help you locate products.) It's much cheaper to go for ordinary balloons instead of helium filled ones. I used plastic sticks from here. The balloons tie onto the sticks easily. 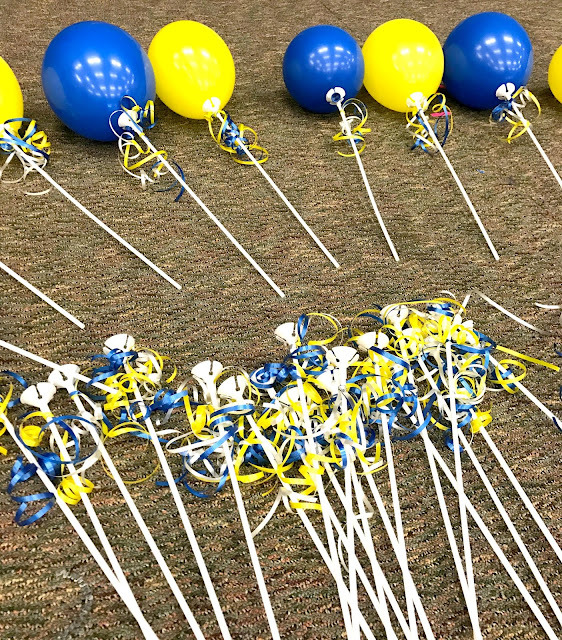 Blue and yellow curling ribbon added color to the sticks. Glass cylinder vases were found at the Dollar Store. Instead of spending money on flowers, I filled the vases with tissue paper. Two sheets of tissue paper per vase. One squished in, the other flowing on top. Brochures from the college were displayed on the tables as well. 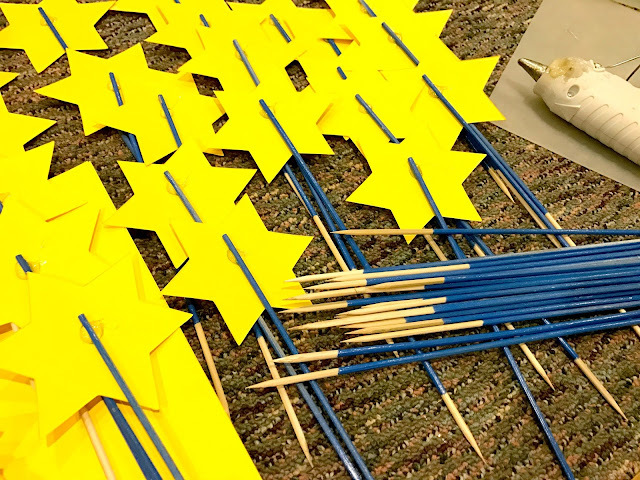 Yellow stars were punched out on the church's die cut machine and then glued to wooden skewers that I spray painted blue. Two each were stuck into each finished vase. 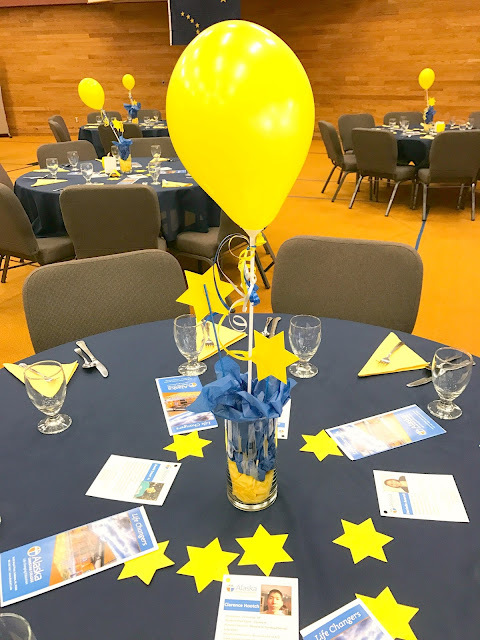 Leftover stars were sprinkled on the tables. 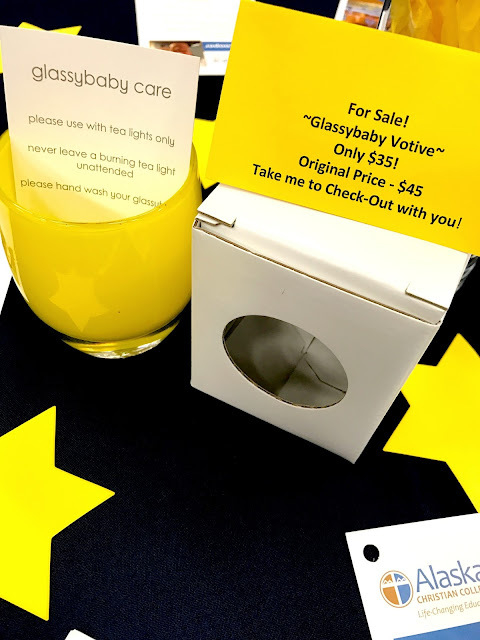 Our youth pastor was able to get these Glassybaby candle votives donated. 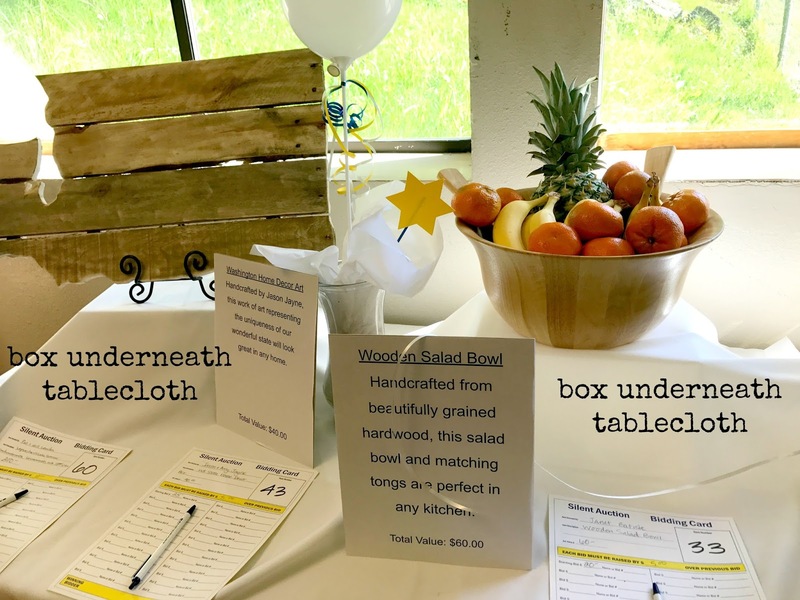 We set them on each table with a set price and instructions if any guest was interested in buying them. 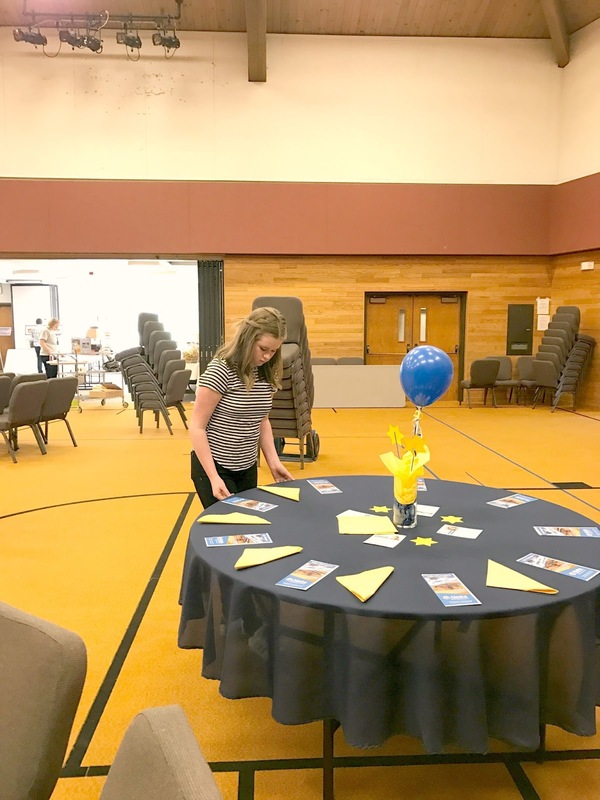 The entire team came to help with set up, which made my job so much easier. 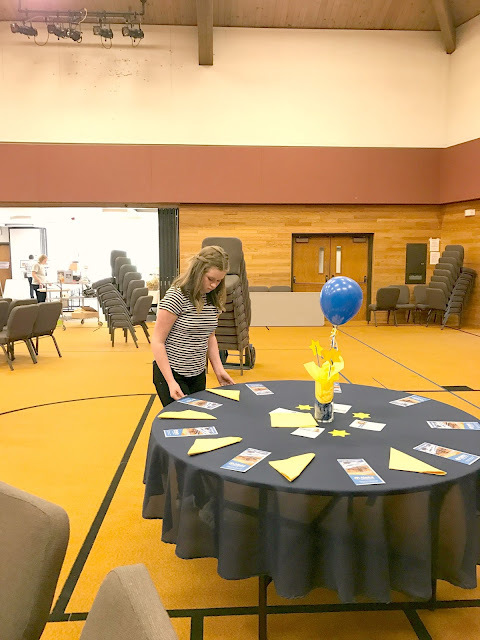 I completely set up one table just the way I wanted, and then asked the volunteers to make each table look exactly like mine. 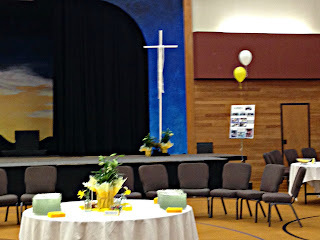 and in no time, the room was pulled together! For the silent auction set up, we used long tables along the perimeter of the room, with a few round tables in the center. We wanted to make sure there was plenty of room to walk and see everything. The trick to make the tables more elegant and interesting, is to add height. Boxes placed under the large tablecloths added height and interest to each silent auction item. Shoe boxes, plastic storage bins, packing boxes, even paint cans--all work well hidden under the tablecloths. 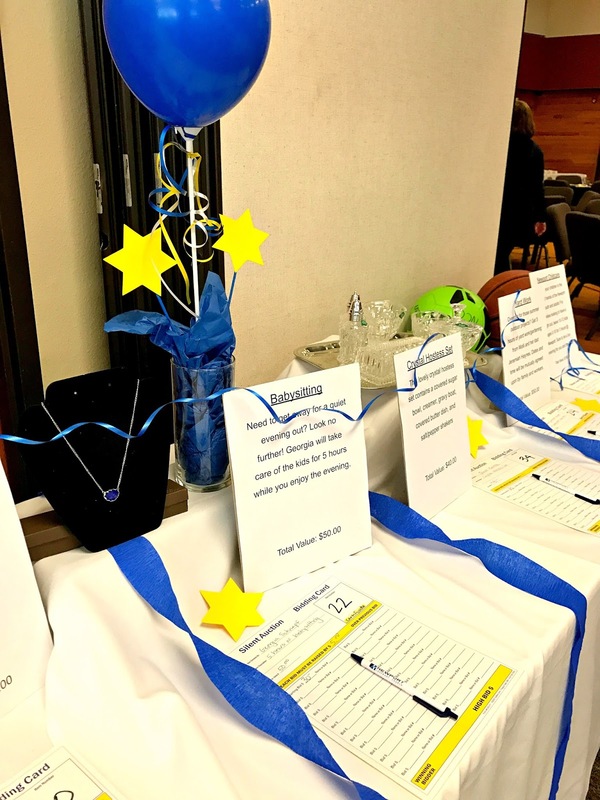 Descriptions of each item were printed out and displayed by each bid sheet. All the team members were required to donate items. Many were experiences and services. 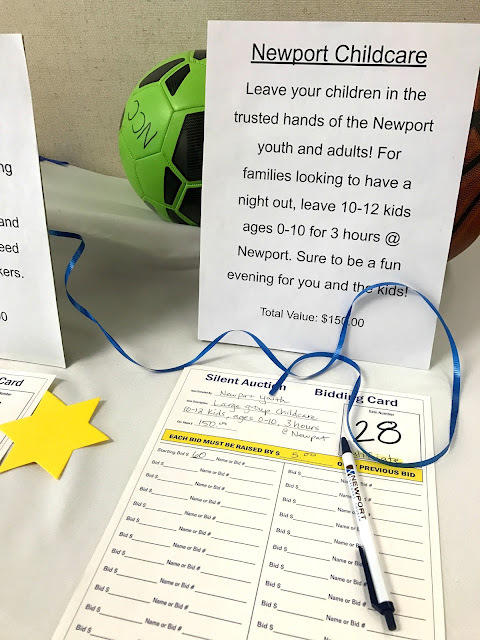 Childcare and babysitting are always popular items at our church fundraisers. 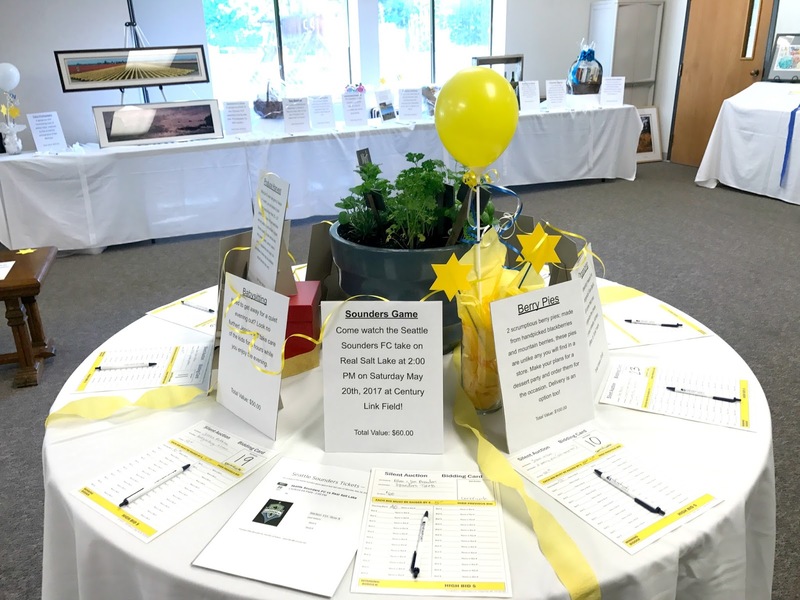 We divided the silent auction items into three colored sections. Blue, Yellow and White. Each section closed at a different time. This allowed our team to get a head start on entering the winning bids into the computer for an easier check out at the end of the evening. 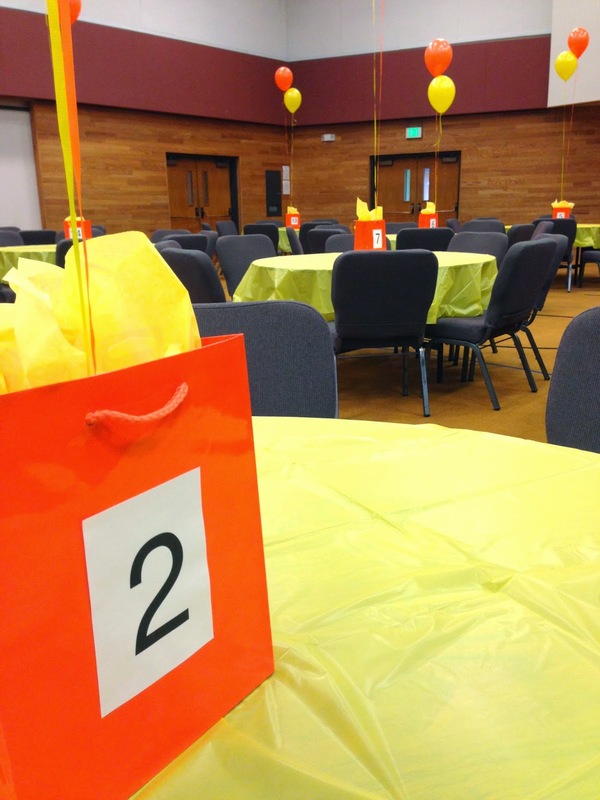 To mark the colored tables, I used crepe paper and color-coded balloons. 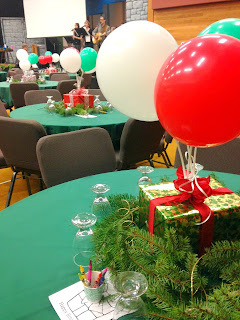 All the baskets were wrapped up in cellophane...and you do know the trick for doing that, right? No? Cellophane bags...yes, they're genius! The best place to find baskets is at second-hand stores. Wash and air dry before using. When packing the baskets with items, always use paper fillers or tissue paper to prop up the items high in the basket for easy viewing. It also makes a basket look 'stuffed' and full. 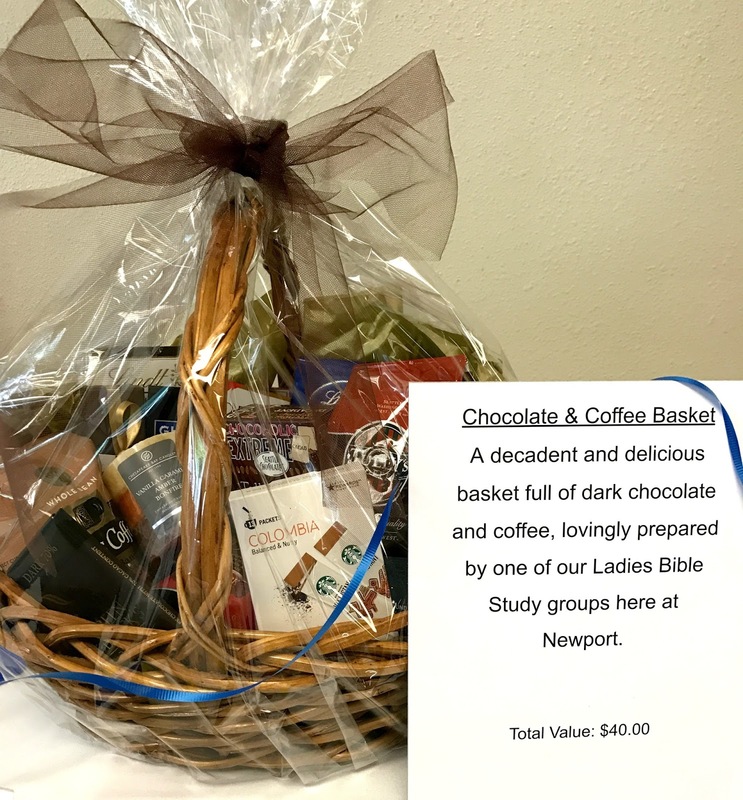 Our Ladies Bible Study Group put together two baskets. 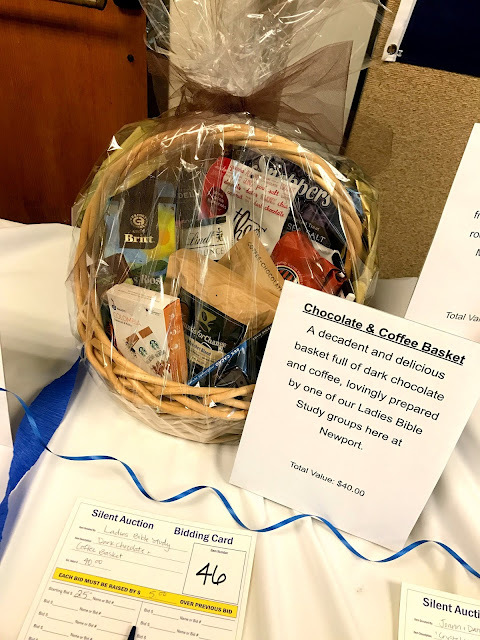 I selected a dark chocolate/coffee theme and asked everyone to bring in a item for the baskets. It was a hit! 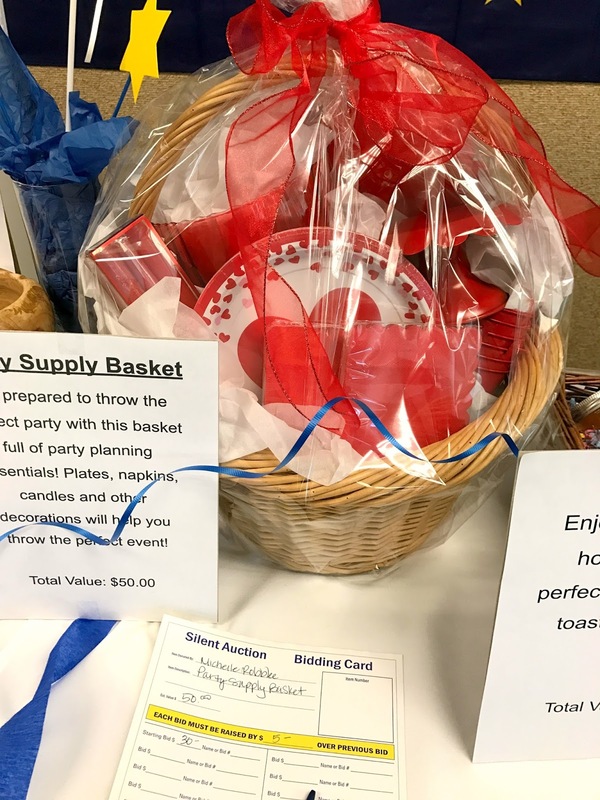 Each basket went for over $150! 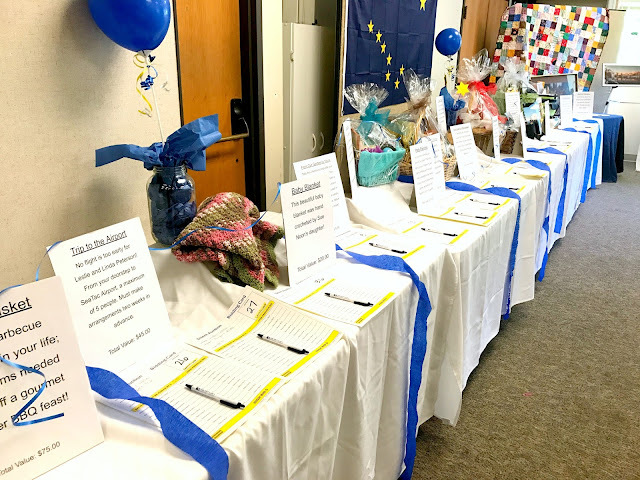 A good silent auction has a variety of items--something for everyone.. Here you can see we had plants, boating trip, office supplies (all wrapped up in the canvas bin) and even framed photography. 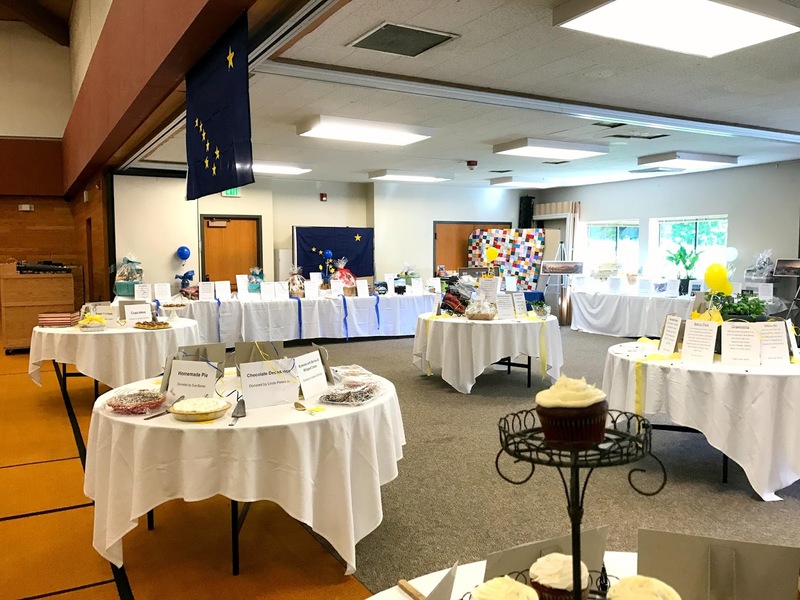 Other items included an herb garden in a pot, babysitting, professional sports tickets and even fresh handmade berry pies to be made in berry season and delivered. Each team member was required to make something sweet for the Dessert Dash. 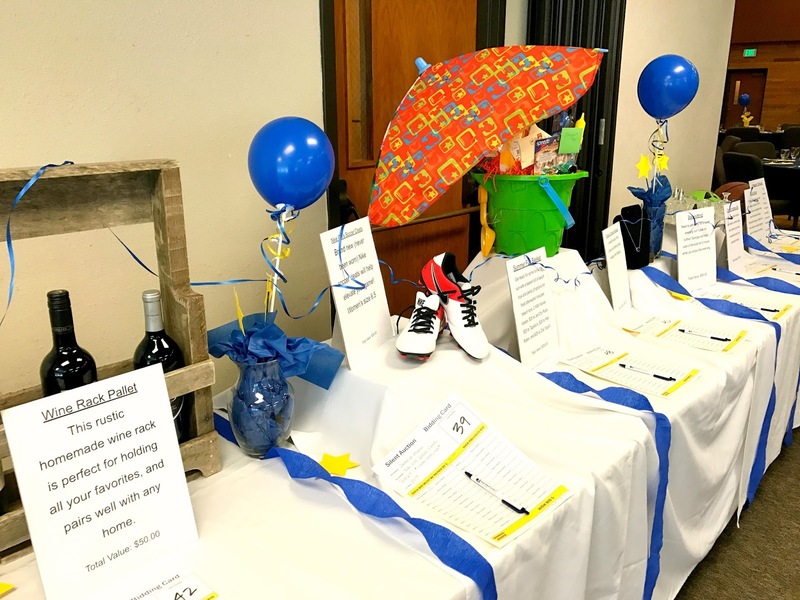 All items were displayed for everyone to view during the silent auction. 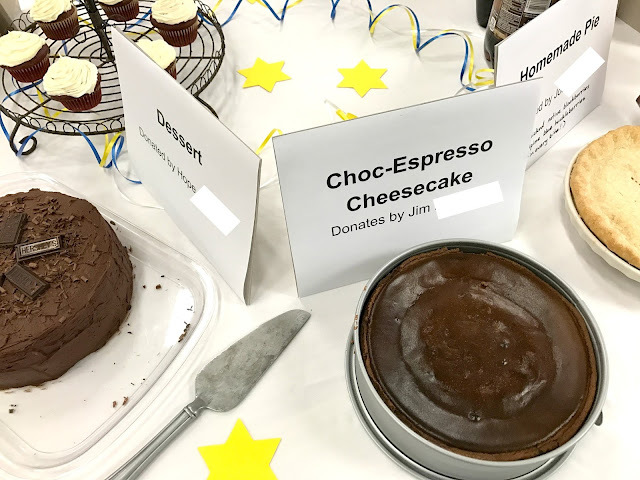 During the dinner, each table pooled their money together for a dessert. Each table's donations were tallied up and called off from highest to lowest. The table with the most money, was allowed to run and choose their dessert first, closely followed by the next highest table and so on, and so on. It was quite fun to watch the desserts being snatched up! 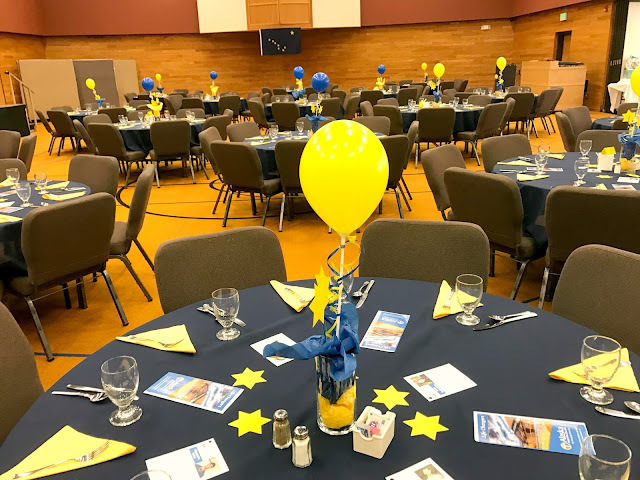 The program consisted of AH (Awesome Husband) sharing about about Alaska Christian College, the trip and telling lots of Alaskan jokes and stories...did I mention costume changes, too? Everyone had a laugh! Near the end of the evening, the entire team came on stage and introduced themselves. They're going to have a great trip! Want to see some more budget-friendly church events?